Mesh Unfolder in a general unfolding utility for unfolding 3D mesh data. It imports DXF/STL/OBJ/WAV surface data exported from a CAD system, extracts the 3D meshes, unfolds (i.e. flattens) the mesh, by minimising tensions, and exports the unfolded data back to the CAD system. A powerful utility that is more general than Sheet Lightning (above) and can be used to unfold boat panels, shoes, lamp shades, aerofoils, or anything else that is made from sheet material. MESH UNFOLDER is very powerful CAD software that is able to unfold 3D CAD designs that are more general than the design set of Sheet Lightning v6, defined by 3D mesh surfaces or surface models. A mesh can be created in most CAD systems, such as Autocad, exported to a DXF/STL/OBJ/WAV file, then imported and unfolded in the Mesh Unfolder software. Smart Sheet Metal Unfold In AutoCAD is a powerful AutoCAD plug-in tool to convert any 3D model into the 2D contour. 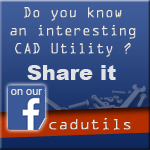 With this tool user can utilize the powerful model capability in AutoCAD to create any sheet metal model and then unfold the sheet metal model into 2D contour layout for the NC Machines.